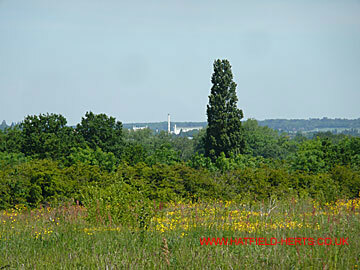 Neighbouring Welwyn Garden City and St Albans – visible at ground level from the hill which is part of the New Barnfield site, particular with changes to wind direction – are at a high level of risk in terms of pollution, health and property blight. However, no one in Hertfordshire is safe from the potential financial fallout. St Albans – a short distance away as the crow flies or the smoke travels. The historic cathedral and abbey can be seen in the centre of the picture. 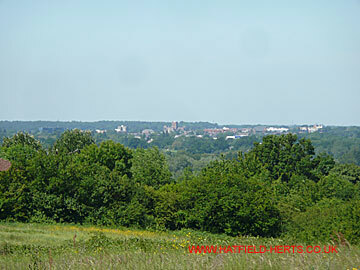 Welwyn Garden City is also visible from ground level. The chimney has gone but Cereal Partners is still there. Any toxic emissions or fallout from the incinerator will go where the wind blows them – smaller particles will also be dispersed by the vortices from express trains and vehicles on the major roads (including the nearby A1M). The main rationale behind proposing an incinerator is to reduce the burden on taxpayers (with the level of indirect taxes in the UK that means anyone who is spending money, and not just those paying income tax) due to the rising cost of landfill (which in order to discourage its use has a rising level of tax – in 2011 it goes up to £56 per tonne). However, incineration of waste is not likely to prove to be a cost efficient solution. The finance to build the incinerator is likely to involve a controversial PFI (Private Finance Initiative). The terms of PFIs are general secret as they are classed as commercially sensitive information. So it will be difficult to gauge whether residents will get value for money (local authorities, like state governments, are generally low risk defaulters, so they should be able to get lower interest rates reflecting this). Although, previous PFI agreements – like those forced upon London Underground – have been bitterly criticised by people with access to all the information. The plant itself will be run by a private operator (Veolia Environmental Services if it is at New Barnfield, Hatfield or E.oN if it is at Radlett) on a 25-30 year contract. For which the company will be guaranteed a level of payments during the life of the contract – even if it emerges there is a health threat that requires the plant to be closed down within a few years of it starting up (or there isn't enough waste matter to be incinerated – given that levels of packaging are going down, levels of recycling are going up and as some other local authorities have gone for incinerator options there could be competition for this waste). The cost of any illnesses caused by the plant will be borne by the National Health Service and local authority budgets (which are paid for by taxpayers). It's not clear who will foot the bill for any clean up operation, should there be an accident, industrial action, sabotage or negligence resulting in a release of toxic material over the surrounding areas. Nor is it clear who picks up the bill at the end of the 25-30 year contract for cleaning up the site if it should be found to be contaminated. Incinerators are hugely unpopular and will generate a lot of extra work for Council officers and staff (which will be an additional cost); likely to involve protests and demonstrations (which will increase policing and court costs); and legal challenges and court cases (from anti-incineration campaigners, from people who believe it has caused them illness, and even from companies proposing to run incinerators – some have sort judicial reviews when local authorities have decided NOT to use incineration after public consultation). To cap it all, some environmental groups argue that incineration is not the most efficient way of recovering / generating energy from waste. Alternative technologies – like plasma-gasification (also involves the burning of waste but at a much higher temperature so the compounds are broken down into elements) and anaerobic digesters – are safer, cheaper to build and run, and generate more electricity. Plus, they are more efficient at reducing the amount of spent fuel (burnt waste / ash) that has to be sent to landfill in any case.